Read CFNU’s letter of support for Minnesota nurses here. Some 5,000 Minnesota RNs began a one-week strike Sunday protesting unfair labor practices by the Allina Health chain to address RN concerns over safe staffing, workplace violence prevention, and demands for cuts in RN health coverage. It’s the first of a wave of RN strikes this coming week, involving 10,000 RNs, extending from California to Massachusetts. The walkout affects Twin Cities RNs at Abbott Northwestern, Phillips Eye Institute, Mercy, United, and Unity. 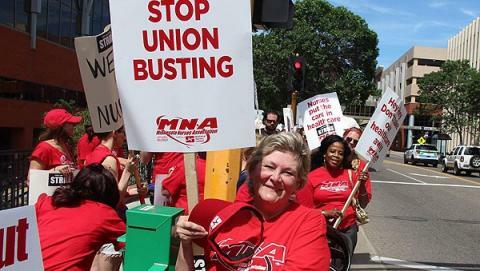 Abbott nurse Judy Pontius, who participated in strikes in 1984 and 2010, is undergoing radiation for breast cancer and opposed the switch to the company plans, two of which come with low premiums but sharply higher deductibles, told the Minneapolis Star-Tribune. Read NNU’s statement of support here. Strikes are scheduled to begin Wednesday of 300 RNs for two days at Watsonville Community Hospital, and Thursday, 1,300 RNs for four days at Kaiser’s Los Angeles Medical Center. At Brigham and Women’s Hospital in Boston, 3,300 RNs may strike for one-day June 27 citing inadequate staffing for the hospital’s Tertiary Care center, short staffing for critically ill children in the hospital’s Pediatric Intensive Care Unit, and lack of proper staffing to allow nurses to take rest and meal breaks. “Many of our patients struggle to breathe,” says BWH RN Maureen Tapper said. “These patients and families need emotional as well as physical support. The reduction in nurse staffing severely impacts the care the patients so greatly need.